Today’s biggest news story was to be found in the pages of The Daily Telegraph. Not the impending US Senate election in which a candidate endorsed by President Trump is accused by multiple women of sexual assault when they were children – he is accused of being a child molester – looks sets to win; not the “big freeze” closing schools up and down the country; not the latest machinations on the Brexit negotiations. No, this was much bigger. Clearly – hopefully – a large tongue was placed in a cheek when that piece was written but taking it with a pinch a salt there is something very smart about this piece of communications. It’s interesting. It’s eye-catching. It’s a bit different. It taps into a cultural reference that almost all parents will surely be able to relate to. It is perfectly pitched therefore to its key audience – parents. It has received significant media coverage today and loads of social media comment. It has successfully raised awareness of the issue the BMJ wanted to raised. Job done. It is easy to be sniffy about this cheeky, frivolous piece of communications but instead we should applaud it. The authors took a risk to raise something they care about and it paid off. Hats off. 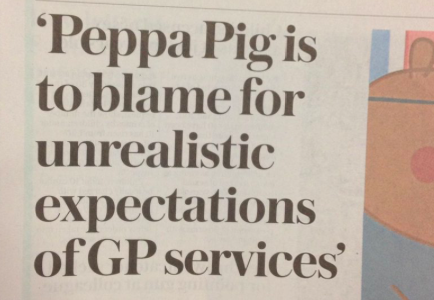 Incidentally, like many parents, I have strong views on Peppa. She is a bossy, obnoxious, mean-spirited, little show off but again that is part of the charm of the message. It prompts a discussion between parent and child about the need to share and be kind to each other. On the face of it – like the piece in the press today – its seems misjudged but its actually a stroke of genius. #commssuccess.